The science of ITER is not simple. But with a bit of imagination (and a dose of humour) a way can be found to convey the most complex physics notions to a public of non-specialists. As no horse was available in the ITER amphitheatre, the re-enactment of the famous 1654 ''Magdeburg hemispheres'' experiment was conducted with two ITER volunteers. 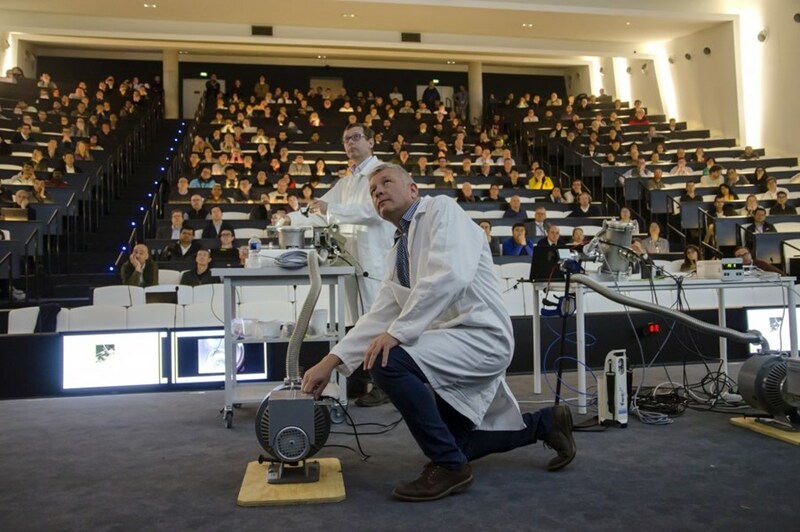 Last week, as a large number of staff members were assembled to attend the fourth presentation in a new ITER technology series, Vacuum Section leader Robert Pearce demonstrated that vacuum—the presentation's theme—not only could be made "understandable" but could also be a lot of fun. One of the highlights of his presentation was a reenactment of the famous 1654 "Magdeburg hemispheres" demonstration, when a German scientist pumped air out of two joined copper hemispheres and had two teams of 15 horses try to separate them by pulling in opposite directions. 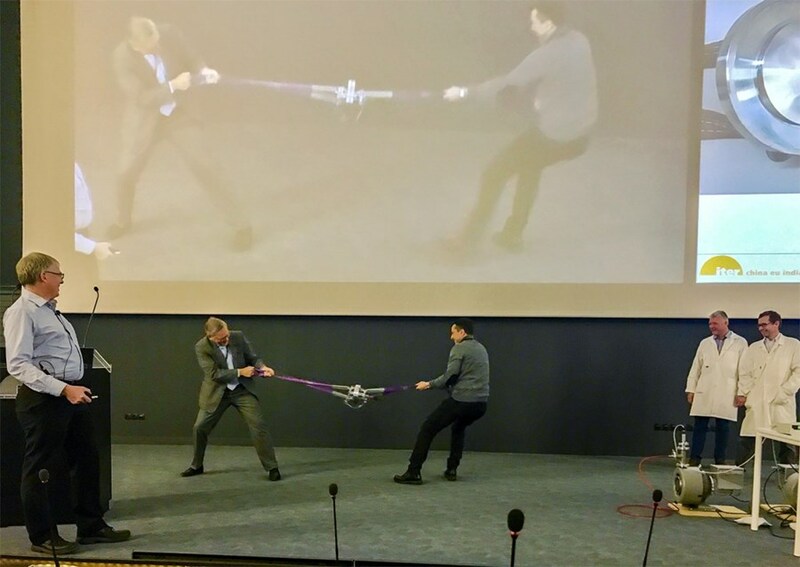 The ITER vacuum team members demonstrated that vacuum not only could be made ''understandable'' but could also be a lot of fun. Pictured here are Liam Worth, vacuum design and construction officer (foreground) and Silvio Giors, vacuum cryo-pumping engineer. As no horses were available in the ITER amphitheatre, the experience was conducted with two volunteers: head of ITER Project Control Office Hans-Henrich Altfeld and cooling water engineer Fabio Somboli. Close to eight years ahead of schedule, ITER's First Plasma was produced last week in the Headquarters amphitheatre ... Pictured here: Vacuum Section leader Robert Pearce (left) and Silvio Giors. There were other very interesting facts to glean from Pearce's presentation—that an absolute vacuum cannot exist even in the deepest and darkest outer space; that vacuum can boil and freeze water simultaneously; and that extremely cold surfaces coated with finely ground coconut charcoal are perfect for imprisoning helium particles. 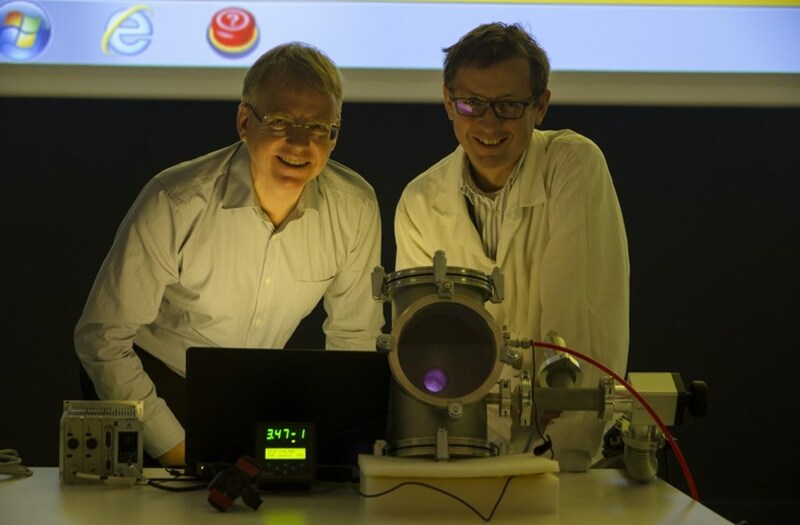 But the most popular moment of the show was the production of a plasma, created by injecting argon gas into a small vacuum chamber equipped with a magnet, and running a current.